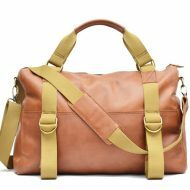 Voila Joshi II Leather Sling Bag is made and created for your daily activities – a casual, elegant, simple sling bag made of rustic, vintage leather texture, perfect for you, men and women who need or are looking for a genuine leather sling bag that is not too big but fit to carry your daily necessities. 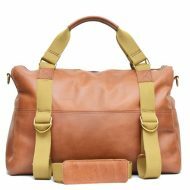 Voila Joshi II Sling Bag has a distinct character of its rustic vintage genuine leather look. 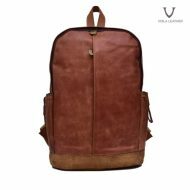 Voila Joshi II is a medium sized sling bag handmade by our experienced craftsmen using genuine lamb leather, perfect for your daily activities hanging out at the mall with friends or on campus. 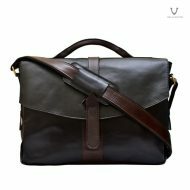 Voila Joshi II has similar design to other messenger bags in general, it has large lid covering three-quarter of the bag with magnetic button locks for easy opening/closing. It also has two small front pockets and one large zippered back pocket. 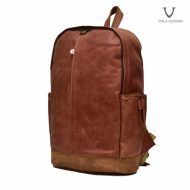 Voila Joshi II main chamber is wrapped with soft and smooth velvet fabric lining for you to put in or out your valuables comfortably, and it is completed with two small inner pouches and one large zippered pocket fit for a 13 inch laptop. 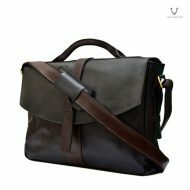 Voila Joshi II Leather Sling Bag is casual, elegant, simple made and created for your daily activities – perfect for you, men and women who need or are looking for a genuine leather sling bag that is not too big but fit to carry your daily necessities.